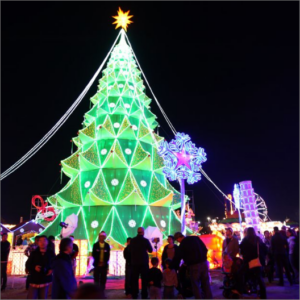 Brighten up your winter by visiting our special seasonal illuminations! The Birmingham Botanical Gardens will be open from the 23rd November to 1st January, where visitors will get a chance to see the grounds like they never have before. 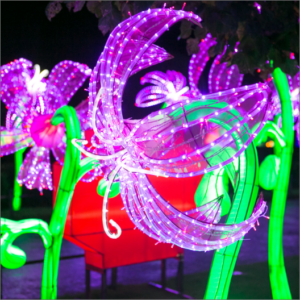 This year’s Christmas themed Lantern Festival will illuminate the gardens turning it into a spectacular fusion of dual culture, vibrant colours and artistic sculptures. 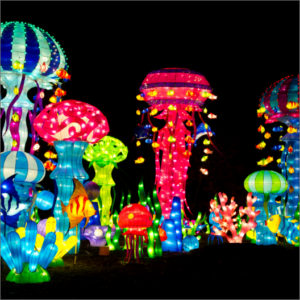 Prepare to enter a magical experience and discover life-sized and large-than-life lanterns in all shapes and forms. The festival is open Thursdays to Sundays each week and then open every day during the school Christmas holidays from Friday 21st Dec. Opening from 5pm to 10pm each day with last entry at 9pm. Children aged 3 and under enter free and do not need tickets. Tickets are only available by pre-booking online. A perfect winter treat for all the family! Please note: there is no parking available at the Gardens for this event. On-street parking is available in the surrounding area, and we are working with our neighbours to try to accommodate families who are driving to the festival. As always, please try to use public transport where possible to avoid congestion and reduce pollution. Thank you. 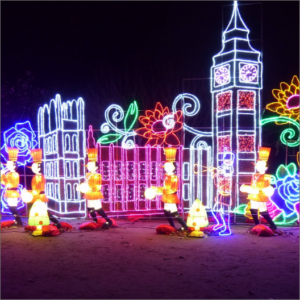 What is the Magic Lantern Festival? 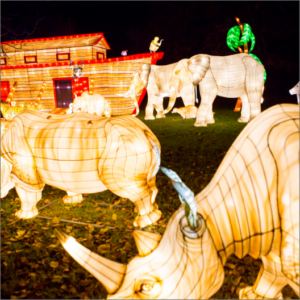 The Magic Lantern Festival is a spectacular fusion of art, heritage and culture, visitors will enter Christmas at Birmingham Botanical Gardens through a giant 12-metre wide lantern entrance, before following a stunning trail around the gardens. 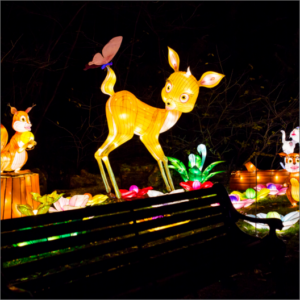 From Santa and his reindeer’s to flowers and animals, these giant lanterns will light up the beautiful ponds, woodland, gardens and pathways of the Birmingham attraction. These unique, artistic and beautifully constructed installations are being designed and made in China, and brought over to Birmingham especially for the event. Joining Santa and his reindeer will be a beautiful 12-metre wide lantern scene featuring penguins, snowmen, Christmas trees and baubles. 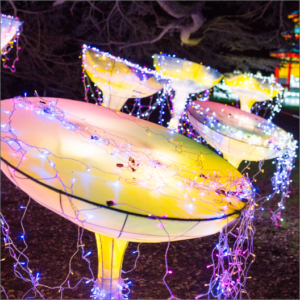 There will also be a giant Christmas fairy themed area, spanning an impressive 500 metres across the garden landscape, with a floating fairy surrounded by beautiful butterflies and a garden floor awash with thousands of brightly lit tiny lights. 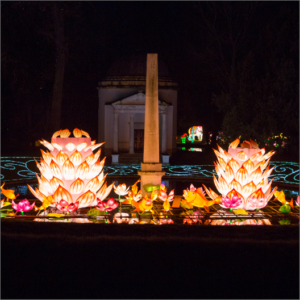 Celebrating over 2,000 years of lantern festivals, Christmas at Birmingham Botanical Gardens will also feature some traditional Chinese lanterns, alongside the Christmas lanterns. 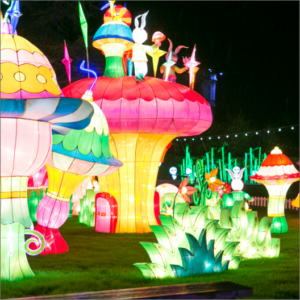 Bamboo pandas will spread out into the open space, alongside a mesmerising Chinese Pagoda lantern that’s wrapped in gold silk and stands at eight metres high. 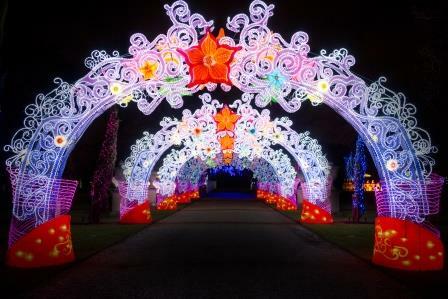 Vibrant colours will continue with a proud peacock lantern that stands at 12 metres wide and three metres high; and even a magnificent scene of giant birdcages, wrapped in flowers and housing brightly-illuminated birds will capture your imagination with its vast 10 metre width and eight metre height. You’ll even see a larger than life grasshopper that stands at almost two metres tall.